I've decided to go with Iron Warriors with my Chaos Space Marines. I've also started my Ork Killa Kan army so lots of shooting coming in 40K. This coupled with getting back into my Dwarfs for Fantasy means alot of shots coming the enemies way. I finished 5 Gutter Runners, an Engineer and 3 Rat Swarms just incase the Hell Pit dies for my Skaven army this weekend. 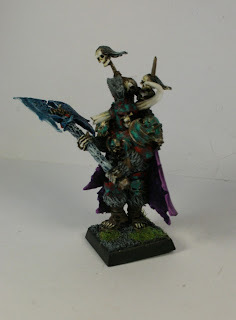 I've also finished a quick paint job of Krell (found here - http://www.ebay.co.uk/sch/elfordminis/m.html?_nkw=&_armrs=1&_from=&_ipg=&_trksid=p3686). I hope to have the Blood Angels finished this week and shift them. They have been sitting around for a year now and I've lost intrest in collecting a full army of them.